From bar events to zombie night to the perennial Dupont drag race, check out our top 10 picks for Halloween-week events. OK... so Boo at the Zoo isn't as scary as some of the others on this list, but it does feature a ton of free candy. (Trust us, your dentist is terrified.) At the National Zoo (3001 Connecticut Ave. NW), the kid-friendly event offers access to treat stations galore, informational talks with the zoo keepers, and a chance to spend some quality time with the animals. Friday, Oct. 26 and Sunday, Oct. 28; 5-8:30 p.m.; $20. Nobody knows the makings of a good costume like a drag queen. Watch hundreds of gorgeous "gals" race in their hottest high heels during the Dupont High Heel Race (17th Street NW from Church to Q). Tuesday, Oct. 30; general merriment starts around 6 p.m.; race 9 p.m.; free. Halloween in a cemetery? Yes! Congressional Cemetery (1801 E St. SE) and their 55,000 residents are hosting the Ghosts & Goblets Soiree, a night full of torchlight graveyard tours, organ music and a slew of other haunting details so grab your costume and head out! Oct. 27, 6-8:30 p.m.; $75. A movie marathon of spooky films features "Shaun of the Dead," "Carrie," and more at AFI’s Silver Theatre (8633 Colesville Rd. Silver Spring) during Halloween on Screen. Saturday, Oct. 27, 10:30 a.m.- midnight. The monthly MIXTAPE dance party will become a hot and haunted good time at the Howard Theatre (620 T St. NW) on Halloween night. Dance the night away to a mix of pop, rock, house, disco and more in your costumed best. Wednesday, Oct. 31; 18+; 10 p.m.-2 a.m.; $10. At the abandoned Calleva Farm (19120 Martinsburg Road, Dickerson Road, Md. ), you'll wander through Markoff’s Haunted Forest on your choice of two trails of terror. If you survive your brush with the dead, you'll have the chance to attend a number of other haunted events. Glide on a zombie zipline, take a traditional haunted hayride, bungee jump for your life off the top of a telephone pole, and more. Each event "costs" a varying number of tickets. Oct. 18, 19, 20, 25-28, 30-31; $25 admission; $25 for 10 tickets. The District's quintessential bar crawl, Nightmare on M Street, packs in the crowds on 19th and M streets NW. 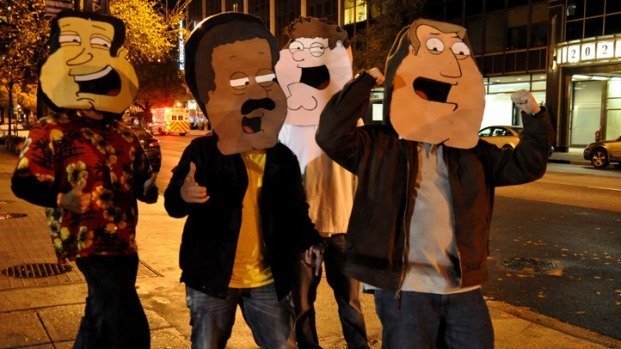 Join in the fun of this roaming costume party, where a one price gets you into more than 28 bars. There will be food and drink specials, costume contests and more. Saturday, Oct. 27.; 21+; $20; 5 p.m.-1 a.m.
Not your regular spooks and tricks, Tilted Torch: Spook-O-Rama brings a new spin to the Red Palace (1212 H St. NE). Head out for a night full of enchanting belly dancing, hallucinations, spells, and raffles. Over-the-top Halloween attire is preferred. Friday, Oct. 26; doors open at 9 p.m.; 21+; $12. Thank goodness the CDC is prepared, because the zombies are coming out to play. 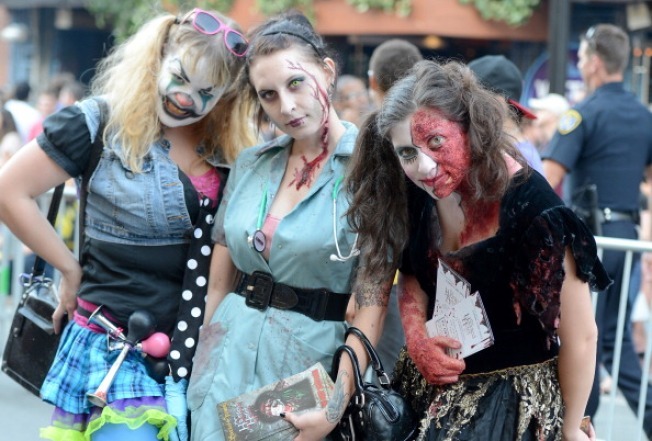 On Zombie Night, assemble amongst your undead friends for dinner and drinks downtown, before heading out to a performance at The Filmore (8656 Colesville Road, Silver Spring) and zombie-themed movies at the AFI Silver Theatre (8633 Colesville Road). Saturday, Oct. 27; 8 p.m. Haunted Houses, Forests, Medical Labs, Etc.